A UNESCO World Heritage site, described by UNESCO as a “masterpiece of medieval architecture” the Castel del Monte was constructed by the Holy Roman Emperor Frederick II during the 13th Century. Built in a remarkable octagonal shape with 8 octagonal towers at each corner, the interior being made up of two floors, each with 8 interconnected chambers. The castle has become one of the most popular tourist attractions in the region. The lack of any defensive structures and lavish construction materials brings into question its usefulness in a military perspective and has led many to describe it as a ‘folly’ – but what a ‘folly’! 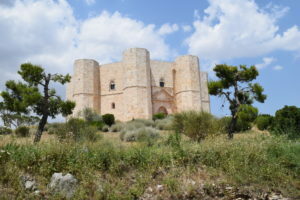 The castle is located near the town of Andria, about 60km (1 hours drive) west of Bari. If travelling by car you will need to park at one of two parking areas which are around 1-2km away from the castle itself. On our visit we opted for the closer one of the two - L'Altro Villagio - which charged €5 for parking. Tickets for the shuttle bus are purchased from the restaurant/bar and cost €1 each (under-10s are free of charge). The bus runs every 10 minutes or so and takes only a couple of minutes to reach the castle. There are facilities (toilets, refreshments and restaurants) at both the parking areas and up at the castle. 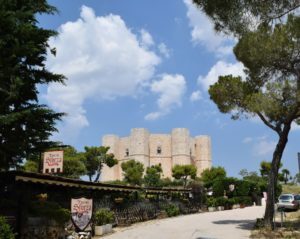 Entrance into the castle is charged at €8 per person, with children under-18 and the over-65s free of charge, and discounts for 18-25 year olds. Guided tours are available but at the time of our visit were only in Italian. On the coast between Barletta and Manfredonia are these impressive saltplains, the largest in Europe spreading over in excess of 4000 hectares, they produce in the region of 5m tons of salt per year. A coastal basin, Lake Salpi, previously dominated this area, where the local inhabitants witnessed the sea encroaching on the southern part of the lake and leaving behind salt deposits when it evaporated. Initiated by the Bourbons, the land reclamation works were completed at the start of the 20th Century, in order to take advantage of this valuable mineral. The sand dunes separating the salt water pools and mountains from the sea are host to many birds, making this a protected area and popular bird watching destination. Visits can be made only through a guided tour which takes about 2 hours. The museum organises children's activities focusing around the discovery and production of salt. Located halfway between Barletta and Canosa is Canne della Battiglia – a large Bronze Age archaeological dig at the site of the Battle of Cannae. In 216 BC, the Carthaginians, led by Hannibal, humiliated and destroyed the Roman army, with hundreds of senators and others of noble birth being killed. The battle had a dramatic impact on the future organisation and strategies of the Roman army, and has become one of the most cited examples of military history. The Antiquarian Museum on the site contains exhibits of a broad date range, from Neolithic times, through the Punic Wars to the Middle Ages. Next to the site there is also a Daunian burial ground and other remains, from pre-Roman history.